Traditionally sold by street vendors, this simple bowl of noodles in soup is now a popular dish with locals and tourists alike. Ho Chi Minh City contains different cusines and styles of cooking as it has been occupied or visited by many seperate cultures, from times of war until today. Vietnamese food is considered one of the healthiest in the world, as traditionally, ingredients are kept as fresh as possible, with minimal cooking to preserve the original flavours and textures. Spices and herbs are often used by Vietnamese cooks to flavour their dishes, however, south Vietnam, which includes Ho Chi Minh City, is more famous for its seafood, as well as vibrant and sweeter dishes, due to the use of vegetables, fruits and coconut milk. Dishes in Vietnam are normally well balanced in flavour, even if the flavours are quite strong, as they believe in applying the principle of Yin and Yang to their dishes. Whilst herbs and spices are used in both Vietnamese and Indian food, the main difference between them is that the Vietnamese herbs are normally freshly cut off a plant, whereas Indian herbs and spices are normally dried, which gives Vietnamese dishes a fresher smell and taste. 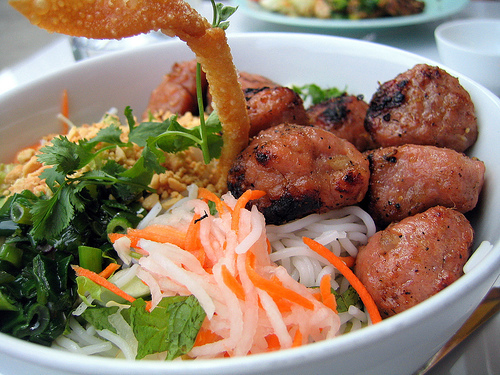 As a result, Vietnamese food is usually rated as one of the healthiest cuisines in the world. There are some French influences on Vietnamese cuisine, which are incorporated into their food, along with influences from surrounding countries, such as China, Cambodia, Thailand and to some extent, India and Malaysia. Also, as a result of Vietnam war, many cities in the south of Vietnam, including Ho Chi Minh City, serve American/Western style food. Traditionally, in Vietnam, there are no “courses” as such. Instead, the richer part of the population will have a number of dishes placed on the table, which is more like a western buffet. However, those who are not so well off will normally have a single dish, which would contain a mixture of flavours. A third style is emerging though, which is more similar to a western meal, as restaurants are catering for the increasing number of tourists visiting the city. Vietnamese noodles in soup, it was normally eaten as a breakfast dish, but is now eaten all throughout the day. Normally served with meat, either beef or chicken, and vegetables, such as bean sprouts, green onion or cilantro (coriander leaves). Originally from China, this dish has crossed into Thailand and then into Vietnam, and is quite a popular dish now. Consisting of a selection of raw meat, seafood and vegetables, It is served with a boiling pot of broth, with herbs and spices inside. The customer then dips the raw ingredients into the boiling broth and cooks it themselves at the table. Whilst curry seems to be an unlikely dish to find in Vietnam, it was first brought by merchants from India, and has mainly found popularity in the south of Vietnam. Chicken curry is the predominant curry in Vietnam, although goat curry is also becoming more popular. It is normally eaten with either rice or baguettes. What happens when you bring baguettes to Vietnam? Well bánh mì is the result. Traditionally it consisted of a piece of baguette filled with meat and vegetables, but today, the bread is lighter and more airy than a traditional baguette as rice powder is now added to the dough. Fillings include, and are not limited to, beef, pork, Vietnamese sausage, chicken, sardines or meatballs in tomato sauce, cheese, eggs or tofu. Vegetables which can be included are cucumber, cilantro, pickled carrot, and daikon (a type of radish). Bánh mì also includes condiments such as mayonnaise or chili sauce. A chain of small noodle restaurants in Ho Chi Minh City, its most famous shop is just outside Bến Thành Market. This particular restaurant became famous after a visit by former President Bill Clinton in the year 2000. This is a more westernized version of the standard noodle bar in Vietnam, with proper tables and stools, menus and waiters/waitresses.